BEVERLY HILLS, CA – The Academy of Motion Picture Arts and Sciences will showcase a new digital restoration of “To Kill a Mockingbird” in celebration of the film’s 50th anniversary on Wednesday, April 11, at 7:30 p.m. at the Samuel Goldwyn Theater in Beverly Hills. The evening will feature an introduction by talk show host Tavis Smiley and an onstage discussion with Oscar®-nominated actress Mary Badham. The digital restoration is courtesy of Universal Pictures, which is marking its centennial this year. 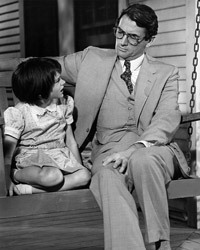 “To Kill a Mockingbird” earned a total of eight Academy Award® nominations and won three awards. In addition to the aforementioned, it received Oscars® for Black-and-White Art Direction (Alexander Golitzen, Henry Bumstead; Set Decoration: Oliver Emert) and Adapted Screenplay (Horton Foote), and nominations for Black-and-White Cinematography (Russell Harlan), Directing (Mulligan), Original Score (Elmer Bernstein) and Best Picture (Pakula, producer). The celebration will continue the following day, when the Academy will screen “To Kill a Mockingbird” for 400 Los Angeles Unified School District high school students as part of its ongoing Media Literacy Program. The film’s remarkable ability to connect with viewers of all ages and backgrounds has made it a versatile teaching tool. Tickets for “To Kill a Mockingbird” are $5 for the general public and $3 for Academy members and students with a valid ID, and may be purchased online at www.oscars.org, in person at the Academy box office, or by mail. The Samuel Goldwyn Theater is located at 8949 Wilshire Boulevard in Beverly Hills. Doors open at 6:30 p.m. All seating is unreserved.